KINGSTON, ONTARIO — A hop, skip and a jump (or a crawl, dodge and a run) from downtown Kingston sits one of Canada’s most storied prisons. Drivers travelling King Street westward might pass and give the regal limestone building and high stone walls nary a second glance. From the road, surrounded by looming trees and a sweeping view of Lake Ontario, the 8.6-hectare site belies its prominence in the nation’s history. The prison opened in 1835 as the “Provincial Penitentiary of the Province of Upper Canada” (it was renamed after Confederation in 1867). In September 2013, the last of the prisoners was transferred to nearby facilities — including maximum-security Millhaven Institution, referenced in the song “38 Years Old” by Kingston-based rockers the Tragically Hip. When the Kingston Penitentiary was decommissioned, it was just 22 years shy of its two-century mark. 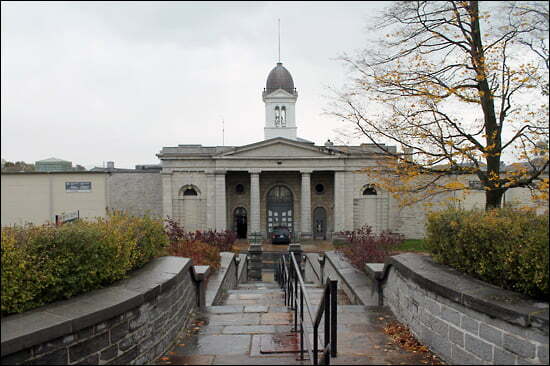 One of the oldest prisons in continuous use in the world, the Kingston Pen housed many of Canada’s most notorious criminals, including Paul Bernardo, James Donnelly of the Black Donnellys and Clifford Olson. During its first century of operation, the Kingston Pen housed women and children as young as eight. Riots, escapes and corrupt guards led news headlines over the years. In October 2013, the Correctional Service of Canada (CSC), in partnership with Habitat for Humanity Canada, offered a limited number of 90-minute tours of the facility that were snapped up as quickly as they were offered. A second round of tours commenced in November. Residents and tourists alike leapt at the chance to tour the National Historic Site. However, despite the popularity of the tours, no further tours are planned, says Kyle Lawlor, communications manager with the CSC. “The decommissioning of Kingston Penitentiary and Regional Treatment Centre will be completed by 2015, and there are no plans in place to offer additional tours of Kingston Penitentiary to the public,” says Lawlor. Unless the CSC reverses its decision, the curious can visit the Correctional Service of Canada Museum (also known as “Canada’s Penitentiary Museum”), operated in the former warden’s residence that was constructed entirely by convict labour between 1870 and 1873. The museum, which sits directly opposite the prison’s front doors, outlines the history of the prison and other correctional centres using displays that incorporate artefacts, photographs, equipment and replicas. The museum is fascinating on its own, with a large collection of items built by prisoners for use in fighting and attempted breakouts as well as objects meant to add small luxuries to the inmates’ lives and to help them express themselves artistically. In a city that is loaded with historical landmarks, thanks in large part to its standing as Canada’s first capital, the Penitentiary Museum is an attraction that offers a different view of life in the early days of the nation. Hours: Weekdays: 9 am-4 pm; weekend hours are only available from May 1-October 31 (10 am-4 pm).